Legislator Sarah Anker has introduced a resolution to make affordable, quality housing available to young adults to stem "brain drain" on Long Island. Legislator Sarah Anker has introduced a resolution directing the county’s Department of Economic Development and Planning to partner with State and County institutions of higher education to study the feasibility of building affordable housing for young college graduates. Anker was joined by, among others, County Executive Steve Bellone, Suffolk County Community College President Dr. Shaun McKay, Jennifer Appel of Long Island Housing Partnership, Community Development Corporation of Long Island President and CEO Marianne Garvin and Long Island Builders Institute CEO Mitch Pally when she announced the resolution last week at Suffolk Community College’s Grand Campus. The resolution came following Anker’s visit to a Planned Retirement Community in her district when she questioned why the same kind of affordable quality-of-life housing made available to seniors could not be made available to young adults who are struggling to stay on the Island. Anker envisions what she terms a PYAC, a Planned Young Adult Community, to address the brain drain issue. A Long Island Index survey shows that approximately 82% of Long Islanders feel that young people are leaving Long Island due to the lack of affordable housing and high cost of living. Anker’s Resolution 1533 would give the Department of Economic Development and Planning 180 days to deliver its findings. 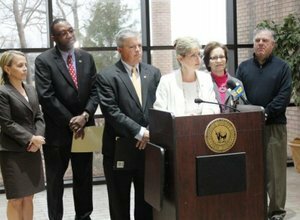 The county is currently looking into partnerships with institutions including Suffolk County Community College, Stony Brook University, St. Joseph’s College, and Dowling College. "For more than a decade, Long Island has been losing college graduates and young professionals,” McKay said. “Today, Legislator Anker has put forth a proposal, and I look forward to reading the feasibility study when it is completed. At Suffolk County Community College we have been working to stop the outward migration of talent from our region. Since 2010, my Stay on Long Island Initiative, in collaboration with Long Island's four-year colleges and universities, has provided $2.5 million of scholarships to help Suffolk County Community College's most talented graduates continue their education right here on Long Island. The program cultivates the intellectual capital of those individuals who have the best potential for contributing to the transformation of our region. We will continue to provide these students with exceptional educational experiences and empowering them to compete and garner employment in the new, complex and ever changing job market and prevent them from leaving our region." In addition to helping young professionals find quality affordable housing, Anker noted that expanding housing opportunities to young adults would also benefit our construction trades, colleges and universities. Share your thoughts about Anker’s resolution below or on our Discussion Forum. Pictured (Left to Right): Long Island Housing Partnership Jennifer Appel, Suffolk County Community College President Dr. Shaun McKay, County Executive Steve Bellone, Community Development Corporation of Long Island President and CEO Marianne Garvin, and Long Island Builders Institute CEO Mitch Pally. Subject: LongIsland.com - Your Name sent you Article details of "Legislator Anker Proposes Development of Workforce Housing to Stem "Brain Drain" on LI"